A Statue is a model of somebody or something, usually of a person or sometimes an animal. It is a sculpture. Several kinds of material can be used to make a statue, e.g. stone, bronze, clay, or wood. Statues are often at least life-size (the same size as the real person), but often they are much bigger, especially statues in the open air. 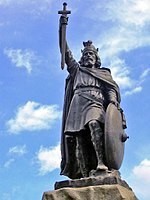 Statues are often made to remember an important person (such as the statue of Alfred the Great), or to remember an event or an idea (such as the Statue of Liberty). Usually there is some writing on a statue to say who the person is. This writing is called an epigraph. The statue may be standing on a base. This base is called a "plinth". A bust is a statue of the head, shoulders and upper body of a person. A colossus is an enormous statue. A statue of someone on horseback (riding a horse) is called an equestrian statue. This page was last changed on 15 September 2018, at 20:44.